Item number K4.179 a-b from the MOA: University of British Columbia. 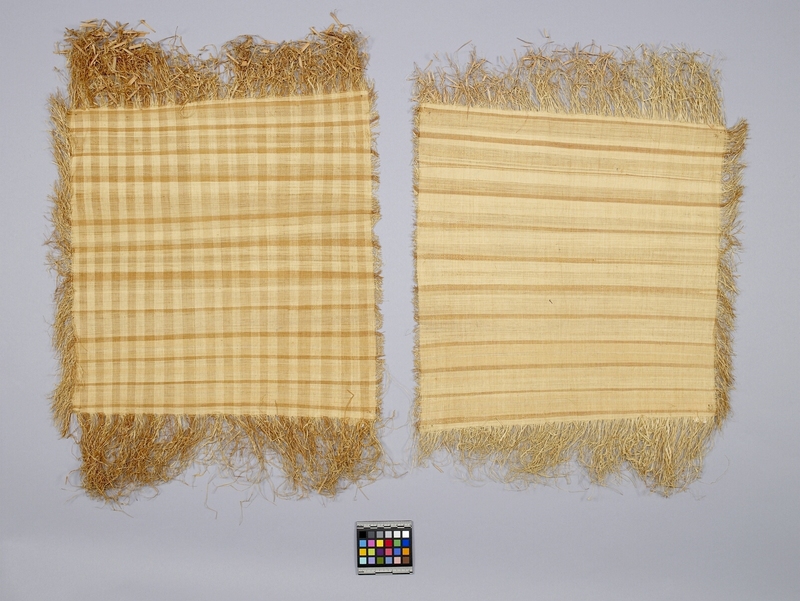 Rectangular, striped mat with fringed sides (part a). The mat is natural coloured with thin brown vertical stripes and much lighter brown, thick horizontal stripes. There is a fine, long fringe on the two ends. There is a medium-length fringe on one long side. There is a very short fringe on the other side. 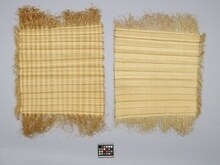 Rectangular, striped mat with fringed sides (part b). The mat is natural coloured with thin brown stripes and lighter brown stripes of various widths. There is a fine, long fringe on the two ends. There is a medium-length fringe on one long side. There is a very short fringe on the other side. used for sleeping and sitting. Made in West Africa, Africa ?